Here is a copy of my newly designed "Sound Technician" business card. 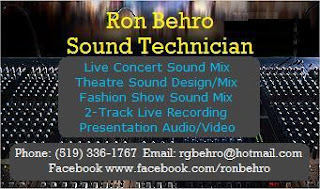 I am a trained sound technician working freelance jobs with the Sarnia/Lambton area. Do you have a sound system for your band but, nobody to operate it? If so, that is where I can be of service. I normally work as a sound technician only using sound systems provided by the band or artist. If you require a sound system for your show or event, I usually rent the appropriate gear locally for the requirements of your show. I will then charge an additional fee for the rental cost of the equipment. If you are interested in using my services, please contact me directly to discuss the details of your show. I will provide you with a job quotation based on the requirements of your production. Thanks for stopping by. I love forward to helping you on your next show or gig.